Whether it's a simple weekend getaway or a double wide retirement home, these cozy cabins and homes can provide the perfect solution. They're available as unfinished buildings or completely decked out with insulation, electrical packages, kitchen cabinets, and bathroom fixtures pre-installed. These log sided camps and cabins are assembled as much as possible before they arrive at your property which means a minimal amount of on-site construction. The single wide models start at 12'x24' and the double wide models are available up to 22'x48'. Hill View Mini Barns provides a clear, written estimate of all the costs involved for the options you choose. Our experienced sales staff will take the time to ensure that your purchase is the right one for your needs. 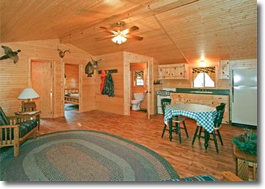 Choose from six styles of cabins depending on your needs. The single wide Settler is ideal for a hunting camp or office and the Cape Cod gives you an overhead loft area. If you'd like an economy camp that you can finish off yourself, look at our painted SmartSide® camp page.